Here I try to help my colleagues who pursue the Oracle Certified Master, Java EE 6 Enterprise Architect Certification by telling my experiences during the certification process. I’d like to provide a comprehensive story so that a candidate can find the answers of the possible questions they encounter during the process at one place. Time is important. I think the faster a candidate completes the process and begins getting on-the-jobs experiences the better it is. From this reason, I tell the effective ways which I noticed in the process to prepare and pass the exams without spending time for unnecessary things. I think the candidate’s background effects the scores gotten from the exams. An architect working 5 years on the job can obtain better score by reading a book than the score an inexperienced candidate who reads the same book obtains. Therefore, I start telling with my background shortly and how it effects on the points I got from the exams so that a candidate reading this story can have a complete idea about how useful my advices could be for him. I already have knowledge about programming, software engineering and architectures. I think, however, it didn’t effect the points gotten, but it improves the spending time. If a candidate is familiar the materials, he can learn it faster. Also, a candidate who doesn’t have a degree can successfully get this certificate. From these reasons, I assess it as very little effective. There is no on-the-job experience requirement for this certificate like PMP. But, maybe, it should be. The enterprise architect position is the highest technical position in an IT department. I think only having this certificate without a minimum 10 years on-the-job experience might not give very successful results on the real world projects. Though there is no experience requirement, in the 1Z0-807 exam, there are some questions which is difficult to answer them without a hands-on experience. I have 8 years experience as web designer, web component developer and java developer and I developed web-centric applications mostly by using JSP, JSF and Servlet. Therefore, I didn’t spend time for the books about them. If a candidate isn’t familiar to these technologies, he should also prepare for them besides the things I recommend to study later in this story. The question types on the expert exams and the 1Z0-807 exam are similar. There are scenario-based real-world questions in these exams. Also, all the Security topic and most of the Integration topic of the 1Z0-807 exam are the same as the topics of the OCEJWSD certification exam. So, I didn’t spend time to study these topics. However, if a candidate doesn’t have knowledge about web services, JAX-WS, JAX-RS, SOAP, REST, SOA and related technologies such as WSIT, WS-Security,..etc., he should study for them as well. In the IBM Tutorial on the JavaRanch site, there is a phrase "mile wide and inch deep." for the SCEA of the J2EE 1.2. This would be a misleading statement for the Oracle’s 1Z0-807 exam. Although I have a very detailed knowledge about Java web services and related technologies, it was sometimes a little bit difficult to answer the questions related to web services in the 1Z0-807 exam. These questions have the same, and sometimes have more, difficulty level than the ones on the OCEJWSD certification exam. Therefore, it shouldn’t be expected an easy and superficial exam when taking the 1Z0-807 exam. The OCPJP exam is about the Java programming. The 1Z0-807, 1Z0-865 and 1Z0-866 exams don’t required you to have this level programming knowledge. From this reason, I assess it as not effective on the points gotten. 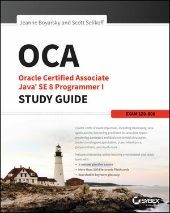 The OCAJP exam’s topics include object-oriented and fundamental programming on Java. Though programming knowledge is not required for the 1Z0-807, 1Z0-865 and 1Z0-866 exams, knowing the fundamentals helps to understand the enterprise technologies easier and better while reading the materials about them. Here I talk about the books and the exam engine I used to prepare for the 1Z0-807 exam. It’s honestly said that I spent very much unnecessary time for the books which are not very effective on the points gotten. So, I talk about these books here so that a candidate doesn’t spend his valuable time for unnecessary things. Later in this section, I tell what I would do if I were in the beginning of my study for the 1Z0-807 exam. The candidates whose backgrounds are similar to mine can use this approach to get a result in a quick way. Paul R. Allen and Joseph J. Bambara. The most important things about this book are that it is the official exam guide for this certificate and that it defines the exam scope. Oracle gives the exam topics; however, it’s not clear the scope of these topic. For example, there are thousands pages written in the books about JSF, EJB or JPA and most of the times these books go to very detail about these topics. So, it could be difficult to know where to stop studying and not go to anymore detail in a material. This book gives an idea how much detail to be studied in a topic. However, studying only this book is not enough to pass the 1Z0-807 exam. There are scenario-based questions in the exam. For example, there were about 30 scenario-based questions in mine. It shouldn’t be expected to find a direct answers to these questions in any book. This book is not effective for the 1Z0-865 and 1Z0-866 exams. This book is the very first material which a candidate should study for the exam. It includes all the topics about the Java Enterprise and doesn’t go to unnecessary details. In the exam, there were 1 or 2 questions about the object-oriented basics such as Encapsulation, Inheritance and the object-oriented principles such as Liskov substitution principle. This books includes all this information. I think, however, it could be answered to these questions without the help of this book. There is useful information in this book. However, it’s very little. Let’s say 5-10 pages in summary. It’s not reasonable to study 440 pages for only 5-10 pages. It’s not worth. This book is one of the good books I read during the process. In its preface, the author says “This book is not a study guide for any of the certification exams for Java and J2EE technologies provided by Sun Microsystems.” Take his advice and don’t spend time to study it for the exam. However, for the real world, it’s a good book to read for an architect. This is the best learning book I’ve ever seen in my life. After studying the GoF patterns from here, there is no need to study another book. However, in order to answer to the questions in the exam, there is no need to study this book. There were 3-4 patterns questions in the exam. They were not scenario-based and not required to have very deep knowledge to answer. So, unfortunately, I assess this book as not effective on the points gotten. This is another good book I studied during the process. The book’s language is developer-to-developer. There is no unnecessary sentence inside. However, there is no need to study this book to answer to the pattern questions. In the exam, there were questions about core J2EE patterns mostly. Also, this book contains very detailed information about JEE patterns. This detail level is too much for the 1Z0-807 and 1Z0-865 exam. From these reasons, I assess it as not effective for the exam. But, for the real world, any enterprise architect or developer should read it. This tool has 897 questions and 6 mock exams including the post measurement exam. There are only %1-1,5 repeated questions, mostly unique. The questions in this exam engine are very similar to the real exam. Also, it only costs $40.50. It’s very very worth it. I didn’t buy the Whizlab OCMJEA 6 Practice Tests. It costs €81.95 for 455 questions and it’s working online. So, it’s not worth it for this price. What would I do if I were in the beginning of my study for the 1Z0-807 exam? 1. I would study The Java EE 6 Tutorial and spend 23 hrs for 1. pass, 10 hrs for review. 2. I would study OCM Java EE 6 Enterprise Architect Exam Guide and spend 20 hrs for 1. pass, 10 hrs for review. 3. I would solve the questions in the EPractize Labs OCMJEA 6 Exam Training Lab min 2 times and spend 46 hrs. And I would take the 1Z0-807 exam in 109 hrs. However, in my case, I spent 167 hrs. So, the 58 hrs was spent for the things were not effective on the points gotten. A candidate whose background is similar to mine can use this approach to get a result in a quick way. Here I talk about the books, the online resource and the exam engine I used and about the Oracle’s course I attended during the assignment process. After, I talk about the approach and the UML tool I used while doing the project in detail. Then, I talk about the submission JAR file structure, naming and how it is prepared. Last, I tell what I would do if I were in the beginning for the 1Z0-865 exam. I recommend to buy the Java Enterprise Architect Certification Discount Package (Training on Demand). A candidate who buys this package gets up to 20% off. In case of the candidate fails, he can buy 2 extra exam vouchers with this savings. In the Training on Demand (TOD) format, it is watched the videos of a Live Virtual Class in 90 days. These are recorded sessions like a film. Whenever I were not sure something on the project, I could turn back and watch the related lesson parts using this format easily. This is not possible with the other formats. Also, Oracle gives the study and activity guides for the course. These guides were also very effective in the assignment process. These chapters include a proposed solution to a simplified master assignment. This assignment is similar to the real exam assignments. However, it should be expected a little more difficult assignment for the real one. These chapters give an idea what a master assignment looks like and how a proposed solution should be in a clear and legible way. I used these chapters extensively while I were preparing my class and sequence diagrams. Also, They gave a good idea how assumptions, decisions, risk&mitigation list, essay questions&answers could be. This book’s assignment example is very high level comparing with the Amritendu’s example. Also, there are missing information and errors. This book’s solution is not a complete proposed solution. But, these are not any important. What is important is that it gives useful ideas, advices, tips and example diagrams. I used the chapter 9 of this book extensively while I were preparing my component and deployment diagram. This is the very first online resource a candidate should use for the assignment. It’s a place where people come together and do brainstorming about programming. After I created my proposed solution, I used this site for the verification of my solution. In general, I realized that my solution was mostly very good. However, sometimes, the colleagues here had a better ideas about how a particular problem could be solved more easily and clearer. It includes the 6 example master assignments and the complete proposed solutions for them. It uses a different solution approach than the approaches of Cade&Sheil and Amritendu. I preferred the Amritendu’s approach to this tool’s approach. Here I talk about my approach I used to create the proposed solution and the UML Tool used. The very first thing I did was to define the project scope and decide what I should do and not do. There are very clear information in some parts of the instruction set about what to be done. In these points, a candidate can’t make an assumption or take a decision not to do that. However, in some points, Oracle deliberately gives not clear information in order to give a chance to the candidate to show his architect’s abilities. A candidate should analyze the instruction set and try to find the tasks which could be not his business so that he doesn’t spend extra time for unnecessary tasks not related to his system. Still, it should be very careful here and absolutely be sure about the task identified should be out of the scope. Wrongly identified parts might cause to miss points. After the project scope was defined, I did detailed analysis of the instruction set and write down all my assumptions and decisions about the integration methods and integration technologies to be used; how and by which ways the required NFRs were provided; how to do the session, state and transaction management; which technologies were used in the client, presentation, business, integration and resource tiers; and which GoF and JEE patterns were used in the system. Therefore, when I started to draw diagrams, my proposed solution was already prepared on the paper. While doing the analysis and writing the Assumptions & Decisions document, I wrote the Risk & Mitigation List as well. In general, the technical risks of a system are about NFRs. Choosing a risk about a FR might not be justified easily. FRs are somethings done in the project. If it’s thought as a risk, then it should not be implemented to create a risk. That is, they are under the developers’ control. However, while an architect applies a hundred of mitigation strategies about the security, still, a forgotten vulnerable point can be compromised. How about the availability of an external system?! what could a developer do about it if the external system is unavailable? Shortly put, when choosing the risks, the NFRs in the system are good candidates. I used the Visio 2003 with the UML 2.2 extension pack by Pavel Hruby. I noticed that most of my colleagues here used the modeler tools such as StarUML and Visual Paradigm. Their justification to use these tools are like these: “It’s UML 2.x compliant. It draws the esthetic diagrams. It’s mature tool. It has an animated verification feature for sequence diagrams’. Then, they complained about that they spent much time for learning the tool and drawing diagrams, especially sequence diagrams. Could it be simply because this candidate uses a modeler tool? Modeler tools have more strict rules to draw diagrams than drawer tools. So, it is normal to spend more time for drawing diagrams by using them. In the real world project, an application architect is required to deliver the architectural prototype. Therefore, modelers can be used to create this prototype from the diagrams easily. However, for the master assignment, there is no such a requirement. Oracle would like a candidate to deliver UML compliant class, component, sequence and deployment diagrams. The criteria to choose a tool here should be how much time a tool is required to draw all the diagrams easily. In order to make it easy to compare with other tools, I give an example from my project. In my project, there are 6 sequence diagrams. The simplest one has 5 objects and 9 method calls (spent 5-6 mins to draw this) and the most complex one has 16 objects and 32 method calls (spent 55-60 mins to draw this). The given times are the duration to start from the scratch to complete the diagram as a deliverable. The class diagram was pattern agnostic, but not technology agnostic. However, I used very little framework related classes. It was all related to the business problem to be solved. The diagram style was Amritendu style. It included the JSPs and the notes about the codes I assumed they had to be in a complete system. I delivered one class diagram which included 33 classes. The patterns used in the system were shown in the component diagram. The diagram style was Cade&Sheil style. I also added to the diagram the components I assumed they had to be in a complete system. I delivered one component diagram which included 20 boxes. The hardware profile, software profile and sizing were shown in the deployment diagram as UML notes. The diagram style was Cade&Sheil style. However, it was much more detailed. I showed the execution environments such as JEE servers and database servers and some artifacts such as deployable units or database schemas. I delivered one deployment diagram which included 14 boxes. There were 6 sequence diagrams. The simplest one has 5 objects and 9 method calls and most complex one has 16 objects and 32 method calls. The diagram style was Amritendu style. They are very detailed and include all method parameters and return types. In the instruction set, It is written to name the jar file as scea-<AAAAAAAAA>.jar. However, in windows systems, it’s not possible to name a file using < or > characters. Oracle said that naming the file as scea-AAAAAAAAA.jar was acceptable as well. I prepared the diagrams as JPEG files and created the simple HTML files for them by hand mostly. For sequence diagrams, I used Visio to create the HTML file. For the other deliverables, I used the Word and the Excel. So, it took very little time to create submission JAR file. After it was created the submission jar file, I tested it by using the Explorer, Mozilla, Chrome, Opera and Safari in Windows XP, Windows 7, Windows 8.1 and Ubuntu 13.04. Ironically, the Explorer couldn’t show my class diagram image that I put in a excel-created html file, while the other vendor’s browsers could show it without a problem. Still, it wouldn’t be a problem, because I already put the links to the diagrams’ jpeg files in my index.html also in any case of happening this kind of problem. /deliverables <- includes all deliverables html, jpeg; the excel and word files I used to create these deliverables. /extras <- includes the prototype interfaces of the system and a high level view of the class diagram. What would I do if I were in the beginning for the 1Z0-865 exam? I would do the same. The process was very effective and completed in 90 hrs. Here I talk about the approach I used while preparing the essay exam. After, I tell what I would do if I were in the beginning for the 1Z0-866 exam. I prepared the 25 essay questions in the 3 categories for the essay exam. The first category is about the NFRs such as performance, scalability, availability, security, flexibility, maintainability, extensibility, reliability, manageability, validity and reusability. I prepared the direct questions and also possible scenario-based questions for all of them, though there were only 4 of them in the instruction set. In my essay exam, there was only one question which was not in my instruction set. The second category is about my technology choices to be used in the client, presentation, business, integration and resource tiers. While I expected one question for each one of them, in my essay exam, there was combined questions which asked about the 2 or 3 tiers at same time. The third category is about the things that are not clear in the instruction set and about the assumptions I made for them or the decisions I took for them. In the essay exam, there were 8 questions which were generic, that is, not about my project related only. They could be asked for any master assignments. Also, there are COPY, CUT and PASTE functions in the Pearson VUE exam engine. What would I do if I were in the beginning for the 1Z0-866 exam? I would do the same. However, it’s honestly said that if this exam were in my native language, I would take it without any preparations. In the exam, Oracle asks about the things a candidate already did in the assignment process. So, in fact, there is no need to prepare for the essay if a candidate is sure about that he can write 200-250 words for each question in Q-keyboard in English in 10-12 mins. I preferred to stay in safe in any case. Thanks for details on your preparation. I am really impressed by the list of study sources you used ! Your story definitely deserves a Cow! It's really glad to know that our OCMJEA 6 Exam Training Lab helped you. I did 1Z0-807 exam. Now I am going to start step two,1Z0-865. But according to Oracle documentation about exam http://education.oracle.com/pls/web_prod-plq-dad/db_pages.getpage?page_id=653≥t_params=p_id:212, it says fist step is Complete one of these courses they have given. Did you flow those expensive courses. If we not flow one of those course, will it not be get the certification. ? Congratulations for passing the 1Z0-807 exam. I wish you will pass the 1Z0-865 and 1Z0-866 exams successfully as well. As for your question, yes, if you don't complete one of the courses, you don't meet the training requirement and can't get certified. In the step 6, you will complete the course submission form and Oracle will validate if you attend and complete the course. Only after your attendance has been verified, you can get the certification. I was looking for same contents. Thank you very much for detailed descriptions. process for exam 1Z0-864 or 1Z0-807 ?